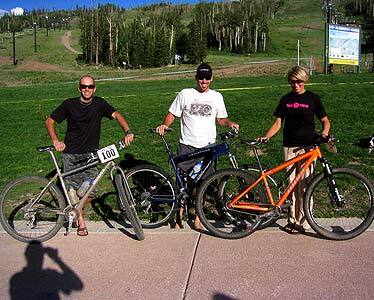 My husband Erik, Brian Blair and I set out for Brianhead Friday morning, with the race scheduled for Saturday at 7:00 a.m. Brianhead is so beautiful, and as we pulled in I remembered the aspen forests and grassy meadows that Brianhead is known for. Anyone who is looking for amazing single track should take a trip to Brianhead in the fall when the leaves turn yellow, and ride down Dark Hollow, Bunker Creek, and the other beautiful trails there. What made this race epic was definitely the scenery. It had been raining on and off all week, so we were prepared to get wet during the race. Brian and I took off and settled in for a long day, and Erik took off for the Titanium 50 course, all of us with our iPods to get us through the long hours. I never saw Brian again until the last 5 miles or so. 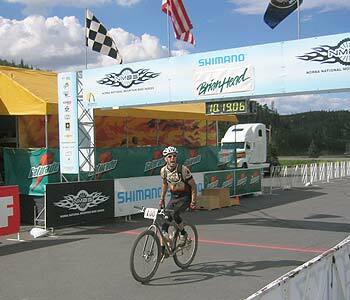 He was fast as usual, but was saving himself for the Leadville 100 in two weeks. The race takes you up to the peak at 11,000 or so feet, then down some swoopy single track, through a small town and into the forest. 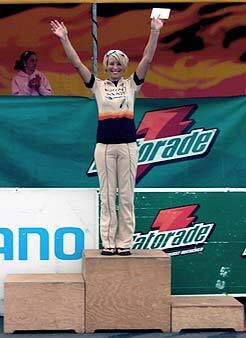 Many a derailluer fell victim to the long sections of deep, wet mud throughout the course. Some sections reminded me of this year's Vision Quest, as the mud caused my bike to feel much heavier than usual. Thankfully, being on a single speed, I survived with only one dive to the hands and knees. I heard Brian may have tried to submerge completely in one of the puddles at some point. I was not wearing a watch, and I remember thinking how glad I was that I would soon finish, but to my surprise, someone informed me that it was only 12:30...only about 5 hours to go. I tried to stay positive and not get discouraged. There were several long flat sections where I was wishing I had some gears, as everyone passed me in their big rings, but besides these flat roads it was a great single speed course. I was relieved to finally arrive at mile 87...only 13 miles to go, which I thought would go by very quickly, but I was so wrong. These last 13 miles were muddy, steep, with a million false peaks. The course sent us up a very steep fire road, back up to the peak, only to have us make a u-turn and come right back down. Cars were blocking the single track we were supposed to get onto, so sadly Erik missed it and had to take a 5 mile detour. Several steep climbs later I could finally see the finish line, but we had to wind down the mountain and it took forever to actually finish the ride. We all agreed that despite the mud and the fact that we were not prepared for the length of the last 13 miles, it was a great course and we had a blast. We ended the weekend with a very long drive home all night, since our plans for staying at a friend's house fell through. Poor Erik did most of the driving, but we arrived in OC in one piece at 5 am. Needless to say we were tired, but it was a great race and worth the drive.